“Everyday Robots” official music video by Damon Albarn is OUT NOW!! Everyday Robots is produced by Richard Russell of XL, with whom Damon produced Bobby Womack’s ‘The Bravest Man In The Universe’- and features guest appearances from Brian Eno and Natasha Khan (Bat For Lashes). Led by title track ‘Everyday Robots’, the 12 songs here invite the listener into Albarn’s world for a genuine ‘one-to-one’ and are the most soul-searching and autobiographical creation of his. The songs’ subject matter is more directly personal than before and is inspired by Albarn’s experiences from early childhood to now, including the trappings of our modern existence, computer games, mobile phones and nature versus technology. The lead, title track ‘Everyday Robots’ is accompanied by a video directed by artist and designer Aitor Throup. 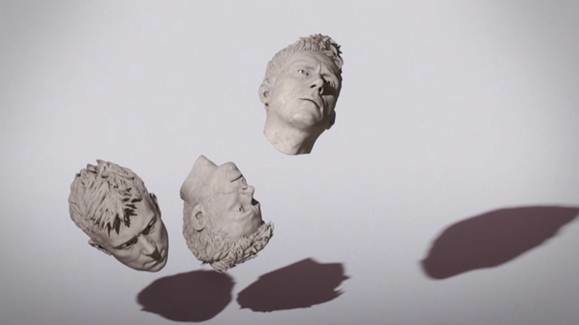 The film is a digital portrait of Albarn by Throup and uses CGI software and actual cranial scans and facial reconstruction techniques to explore and reveal the process of building a uniquely personal portrait of an artist and individual.